Welcome to Day 3 of our Thanksgiving Survival Guide! 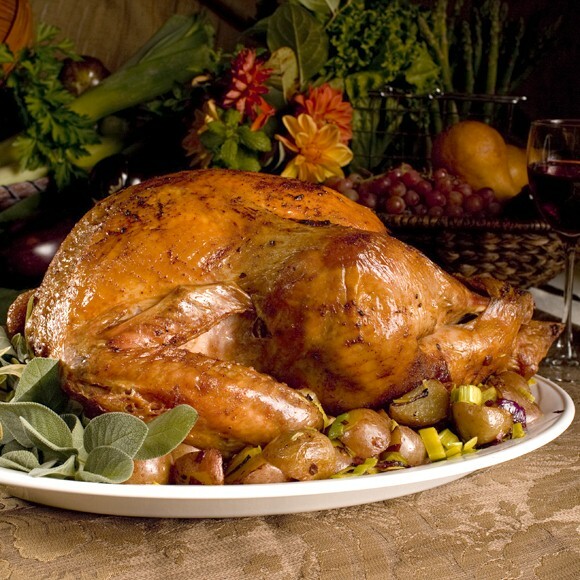 By now, you’ve learned some turkey roasting basics, so you chose a technique to initially protect the turkey from the dry heat; it is in the oven roasting beautifully, and you are basting away diligently – this is great! Now comes the second step towards a moist, juicy bird – don’t overcook it! First, use each basting as an opportunity to keep an eye on the browning. If the skin becomes too brown – too soon before the bird has cooked through, you can prevent over browning or burning, simply by shielding the skin. You do this with a piece of aluminum foil, shiny side up, that you crease from side-to-side across the center to form a tent shape. Place this tent very loosely over the top of the turkey. Be sure to leave at least 2 to 3 inches open between the bottom of the foil and the top of the roasting pan, to avoid trapping moisture or steam under the tent (remember, dry heat). If at this point the bird is already as brown as you would like, use the foil shield through the remainder of the cooking, and continue to baste as usual. reading, and then remove. Once found only in professional kitchens, these great little tools are widely available for home use, and handy for testing the temperatures of other types of meat as well. Some recipes will tell you to test the internal temperature at the thigh and others at the breast, and there is a broad range of suggested internal temperatures to choose from, as well as the USDA’s recommendation that the overall internal temperature of the bird be at 165° degrees F. There are lots of variables from oven to oven as well as bird to bird, so what works well with one bird may not be as perfect with the next. To help you choose a method, first know that to test the temperature of your bird, push the point of the thermometer deep into the thickest, meatiest part of the breast or the thigh, down to the bone, without coming to rest on the bone. It is also a good idea to check both sides of the bird. In a matter of a few seconds the needle will rise, at first quickly and then slowing, and then stopping at the internal temperature. Next when deciding, keep in mind that the ideal final internal temperature is 165° degrees F, and that the bird continues to cook and the internal temperature rises about another 5 to 10 degrees as the bird rests. Also, remember that the breast will cook faster than the thigh. Whichever method you use, taking the bird out when you get a reading of 160° degrees F is a passive way to safely reach 165° degrees F at the testing site of your choice. Use this link to our next article to find out what to do once you are ready to take the turkey out of the oven. 1) If you see that your bird is browning unevenly, it may be due in part to uneven heat zones in your oven. Don’t be afraid to spin the bird around in the oven once or twice during the roasting process to give all parts of the bird exposure to the varying heat. This should help even it out. However, especially in this instance, be sure to test internal temperature on both sides of the bird for doneness. 2) When roasting an unstuffed bird, and using an x-shaped rack, many cooks will start with the breast down, for the first one-third of the cooking time. This increases the rate at which the thighs cook, which will help achieve a more consistent temperature throughout the bird. 1) When you remove the turkey legs, if you find that the meat around the thigh joint is still too pink, just cut the drumsticks from the thighs, and put the thighs in a shallow pan in a 450° degrees F oven until no longer pink, 10 to 15 minutes should do the trick. Having to do this is still better than drying out the entire bird.